I have set the road pins and string lines up to the required diamensions and double checked that all my corners are square, the entire width of the raised seating area and reflection pond area will be 4300mm. Using the centre of the kitchen window I have transferred the centre line down the wall to ma pin and to the far side of the 4300mm wide garden by means of the set square again, once I’m completely central I pull my lines taught. The red cross is perfect centre and I mark out the reflection pond from this point, the outer sand lines are the outside dig markings, allowing for a 225mm block wall. The team remove the surface consolidated sub base and stock pile for later use as the reflection pond concrete base, the membrane is cut with a sharp stanley knife to expose the sub grade. The required depth will be 550mm below top of sub grade level, to ensure a completely level dig we again use the rotating laser level to guide us. 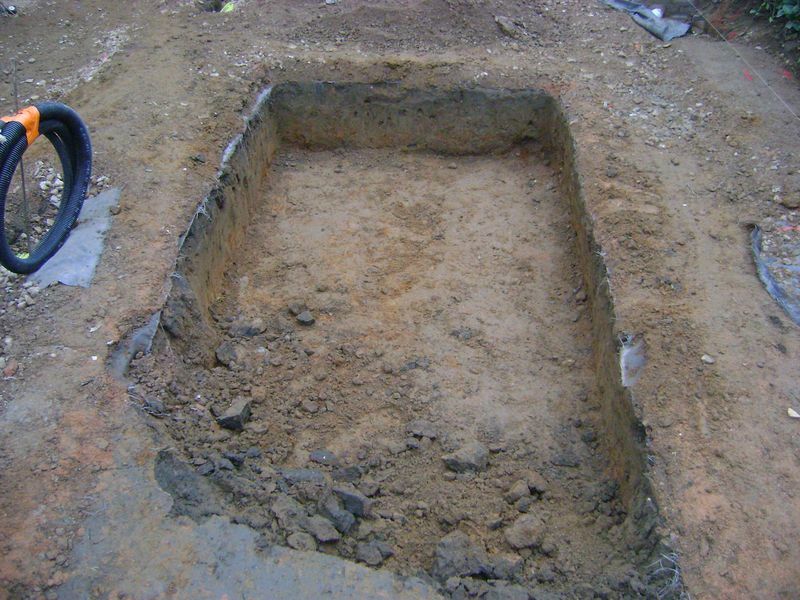 All excess soil is removed to the front of garden for later use. 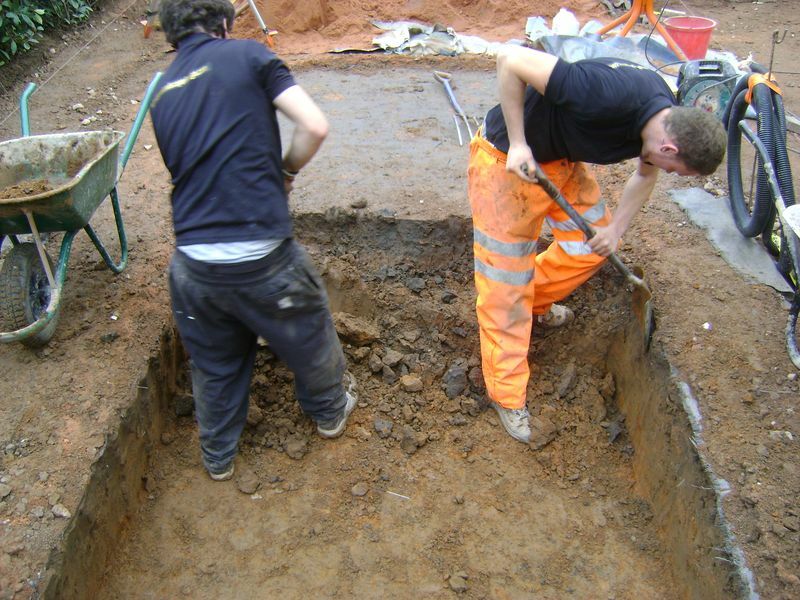 The team hand dig the reflection pond ensuring that the side walls to the excavations are plumb, making later life easier when the time arises to install the 225mm wide concrete block works. 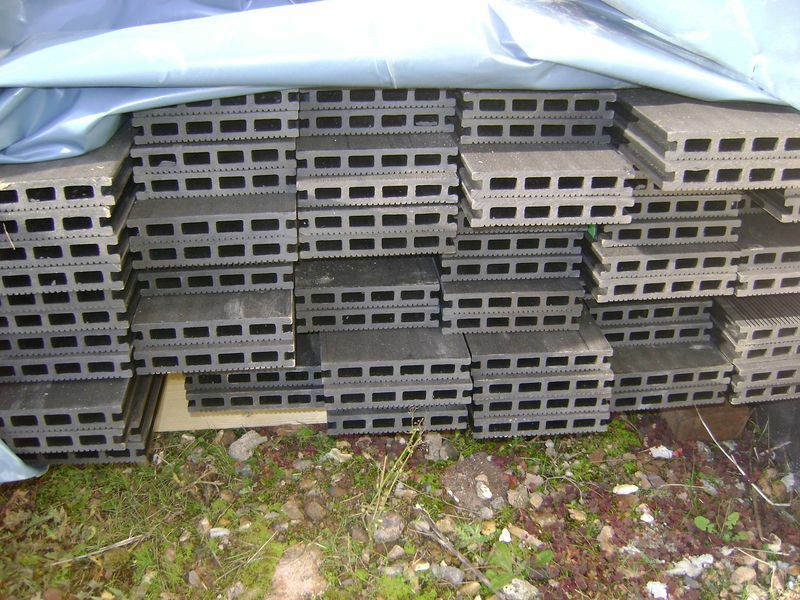 The delivery of the hollow Saige charcoal composite decking was stacked on level wooden bearers so not to warp the deck boards. Then covered to maintain dry boards for the installation process. 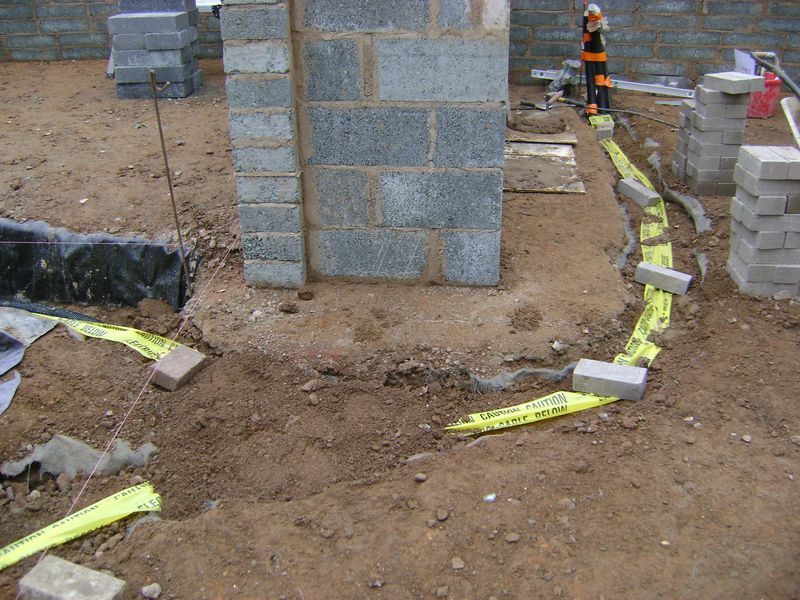 The remaining electrical ducting is hand dug to the required depth of 400mm below FFL, finish floor level, the ducting is installed with in the trench making sure that the ducting is not crossing over each other. 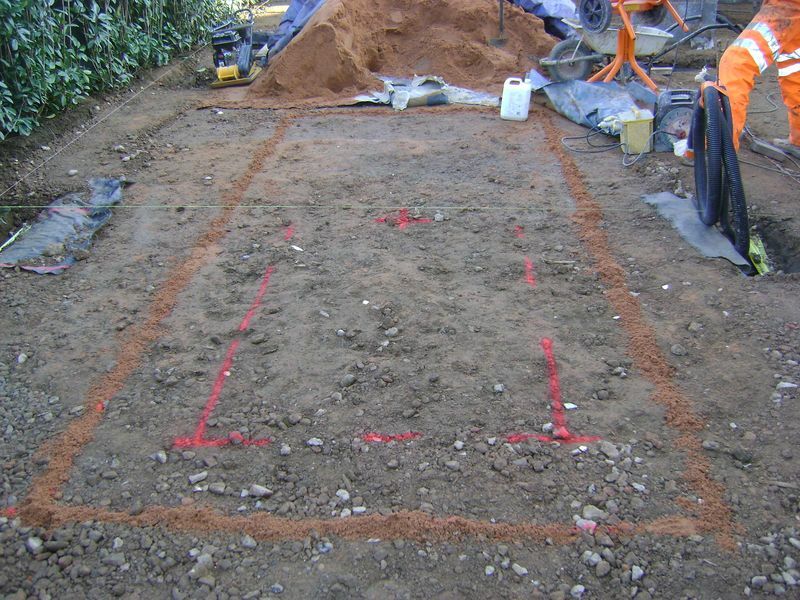 The sub base backfill is barrowed to the trench and semi filled, the warning tape is installed and the trench filled to the correct level. 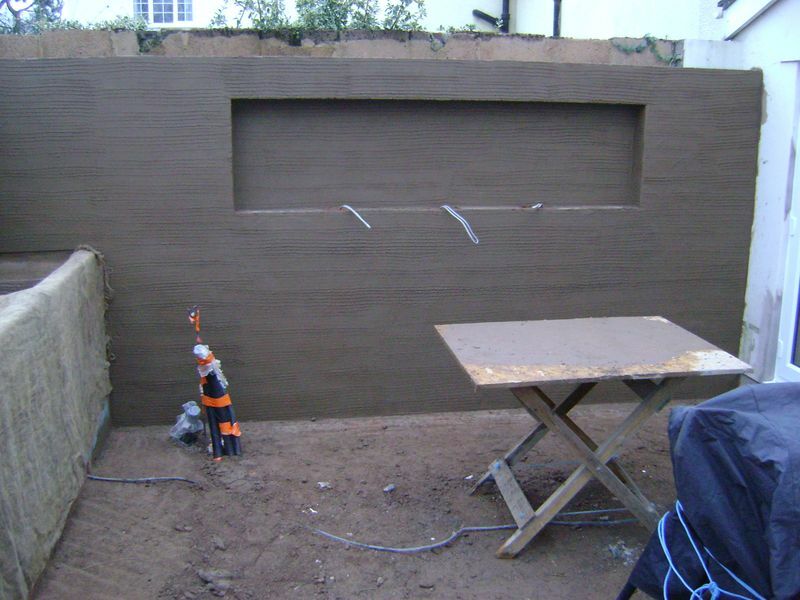 The final course of brick work to the recess feature garden walling has been installed now that the mortar has been setting over the weekend, this course was installed first thing allowing the setting to take place. 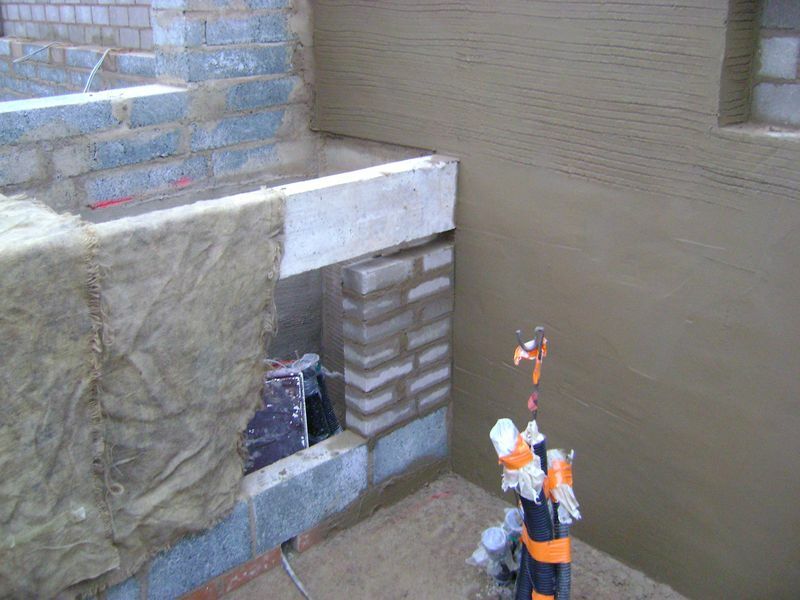 The plastering spot board is set up and water is applied to the dry board, the water application to the board stops the wood from sucking the water out of the scratch coat mix, this principle also applies to brick layers spot boards and the first mix of mortar in the wheel barrows. Renders are a mixture of only 3 ingredients: lime, sand, and water. 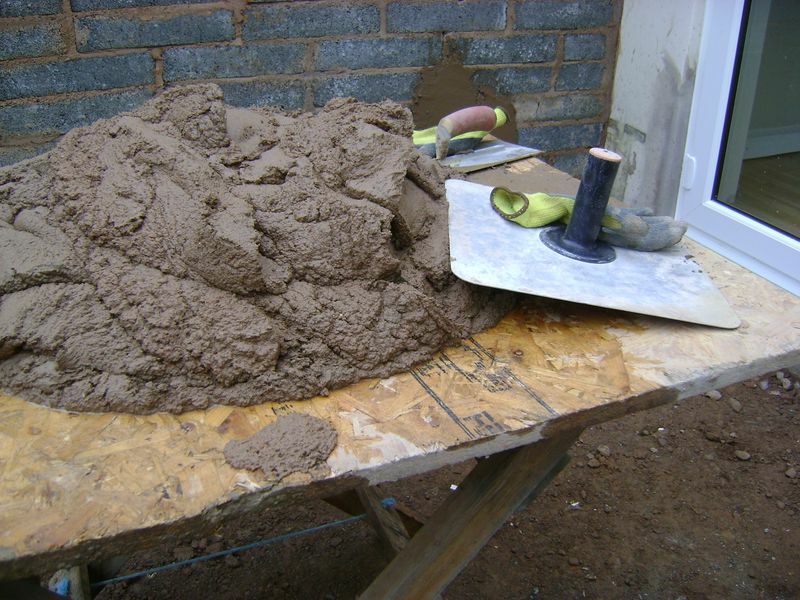 Ordinary Portland cement, OPC, can be substituted for a portion of the lime, which will result in a stronger, but less breathable plaster. I always use a splash of Febmix with all my scratch coats. Note that my rendering plaster mix is creamy and soft, the sand is course with granular small stones and grit within. Also note the angle of the steel trowel, at this angle I’m not leaving trowel lines in the render nor is the trowel so flat that I’m tearing my scratch coat off the feature wall. It’s all in the wrists !! Once the first coat of scratch coat render is applied but not set, I lightly scratch the surface throughout the wall to provide a key for the next layer to adhere to, I’m careful not to apply so much pressure that I scratch to the face of the blocks below, this will cause the ripples and waves I mentioned in my previous blog. Once the scratch coat render has been laid on and the light scratch for the top coat has been achieved, I clean the base of the footing of mortar snots and the spot board. 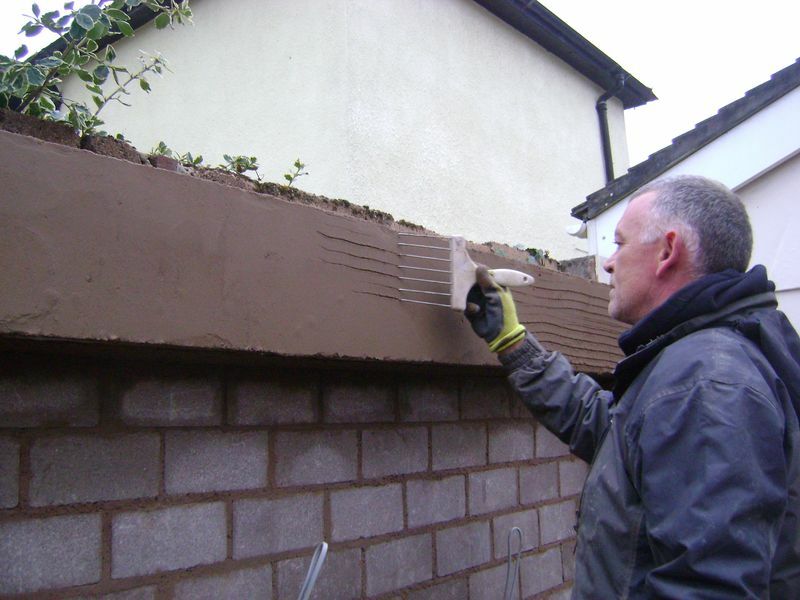 Again this process makes life easier for laying on the top coat of sponge finished render. 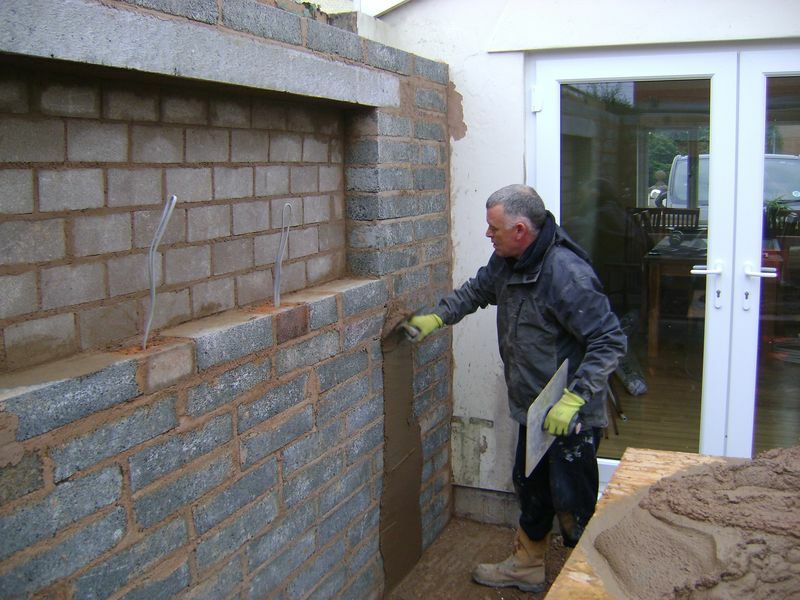 I have installed the brickwork to the kitchen kitchen storage space, again I leave the final course of brick until the mortar has set hard. All the openings to the cupboard space will be 560mm wide. In my last blog I mentioned that my lintel was assured for delivery today, actions speak louder than words Jewsons, pull your fingers out, I really do need this lintel as you can see I’m pressing forwards with the rendering.